A reminder that next week we will be holding auditions for our next production, Punch and Judy, an adult only adaptation using actors not puppets. See home page for all audition requirements. 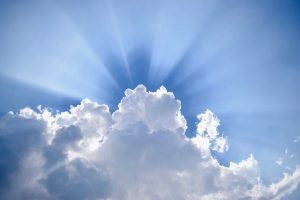 There are no weekly workshops planned for the time being. We’ll update you with specific workshops later in the year closer to the time. *Please note the earlier start time of 6pm. This week we look at a key concept of Marxism, ‘base and superstructure’ and its relevance to Brechtian theatre. 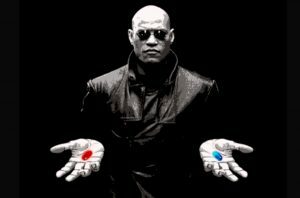 We’ll delve into it more by looking at extracts from ‘The Matrix’, the cyberpunk film from the Wachowskis, which exposes elements of ‘superstructure’ in a populist manner. 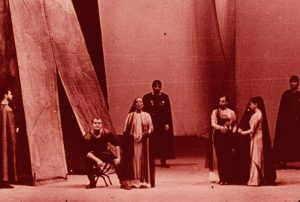 As this is the final workshop of the series we’ll finish with an overview of Brecht’s theatre, his plays and his theoretical writings asking what influence he has had on modern theatre practice. This week we look at Brecht’s adaptation of Shakespeare’s tragedy, ‘Coriolanus’ which deals with imperialism and class war, subjects of great importance to Brecht. 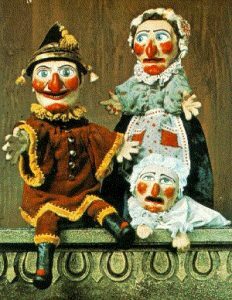 We are excited to announce details of our 18th production to date, an adaptation of ‘Punch and Judy’, for adults. There is no need to prepare anything for the audition but if you’re planning to come send a confirmation email to info@burjesta-theatre.co.uk . Please note this is unpaid work. 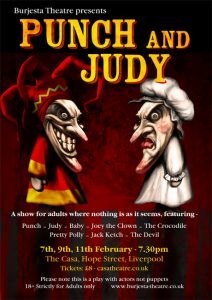 Our 18th production to date is an original adaptation of the Punch and Judy story for adults. 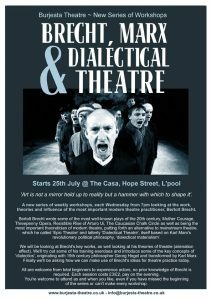 We will be performing it at The Casa Fringe Theatre on Hope Street, Liverpool on the following dates: 7th, 9th, 11th February. Rehearsals will begin in the last week of November, once a week through until Christmas. From the first week of January through until performance there will be intensive rehearsals three times a week in the evening and possibly a Saturday daytime rehearsal as well. Firstly if you’re going to audition please send an email to info@burjesta-theatre.co.uk confirming your attendance. You do not have to indicate which character(s) you wish to audition for. There is no need to prepare a text for the audition. The audition will be a ‘workshop audition’ with a combination of group work and text to be performed, either a monologue or duologue which will only be given out on the night but for which you will have time to prepare within the audition. Finally there will be a short informal chat with the director and producer to cover details of the production. Please come dressed for a physical workshop, trainers, loose fitting clothing for example. Burjesta Theatre Workshop is cancelled tonight due to the workshop leader being unwell. Workshops will resume next Wednesday 3rd October.